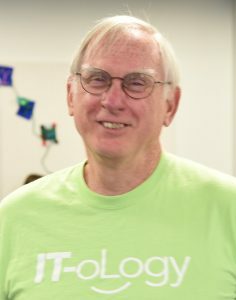 If you’re looking for a way to combine your IT knowledge and skills with your desire to invest in the next generation, volunteer with IT-oLogy! Are you a technology newbie? We need you too! You don’t have to be an IT expert to serve as a volunteer. We’re looking for individuals who share our mission of helping others take advantage of the unlimited opportunities information technology offers. Whether you choose to teach middle school students, work at an event booth, or supervise at a summer camp, there is a place for you to serve at IT-oLogy! Simply complete and submit the form below. The next page you’ll see after submitting the form will allow you to complete and sign our Volunteer Form consenting a background check. Thank you again for your interest in volunteering with IT-oLogy! Please be sure to check your junk mail or spam folder for any correspondence. “Raised on a farm driving tractors and buckin’ hay. Got a degree in electrical engineering. Worked on a couple of defense systems and various telephone systems culminating in writing standards for cellular telephone networks. I like technology generally, but especially telephones, Linux, Raspberry Pi, and the Internet of Things.